April Beauty Faves | ya, we're basic. Well we’ve made it to April and despite the weather NOT GIVING A SH*T, here we are. And even though it’s not as warm as I’d like, the season is changing and my skincare routine needs to follow suit. I recently started using a few new beauty products (hair, skin and body) so I’m sharing the brands and why they appeal to me. There’s a lot to unpack below, so stick with me because there are a ton of goodies to discover, I hope you like them as much as I have. Starting with The Ordinary (and it’s parent company Deciem) because my goodness, this sh*t is good. Like really, f*cking good. And insanely affordable. Basically giving the stuff away. In my rotation I have the Salicylic Acid, Hyaluronic Acid and Hylamide SubQ Eye Serum. And that is definitely only going to be the beginning because at these prices, it is worth it to test out a few more products and see what works and what doesn’t. I came across Philosophy products after a luncheon with Gabby Bernstein last year. I always though it was a tad hoaxy but I finally gave it a try and I’m very happy to report that it is actually awesome. I haven’t found a better everyday cleanser to remove all of my makeup and leave my skin feeling clean without drying it out. Plus, I am literally obsessed with Pure Grace. I have the fragrance, body wash and moisturizer – they are so right, nothing smells better than that classic soap & water combo. They nailed it. But my absolute biggest surprise from the brand is the Ultimate Miracle Worker Night Cream. It is a literal dream! This two-in-one moisturizer and serum hydrates my skin and I wake up with a delicious glow that my skin has been missing the past couple years. I discovered this brush through WeWoreWhat and it is actually an amazing brush that I’ve been missing out on. While other brushes claim to detangle, smooth and soften hair, I swear this one actually does. I can’t see myself using another brush anymore. It makes brushing out wet hair a breeze and that is coming from someone who spends a ton of time trying to detangle after not washing her hair and working out week after week. This brush has made a difference in how much I have to pull and prod on my hair when it’s wet or dry and I don’t know how I could go back to any other brush. I even ordered one to carry around in my purse because it’s that good. I need it with me at all times. Ahh Dermalogica. The lifesaver that kickstarted this skincare and beauty revolution in the first place. I’ve been working with their Canadian team here in Toronto on monthly facials and skin analysis. 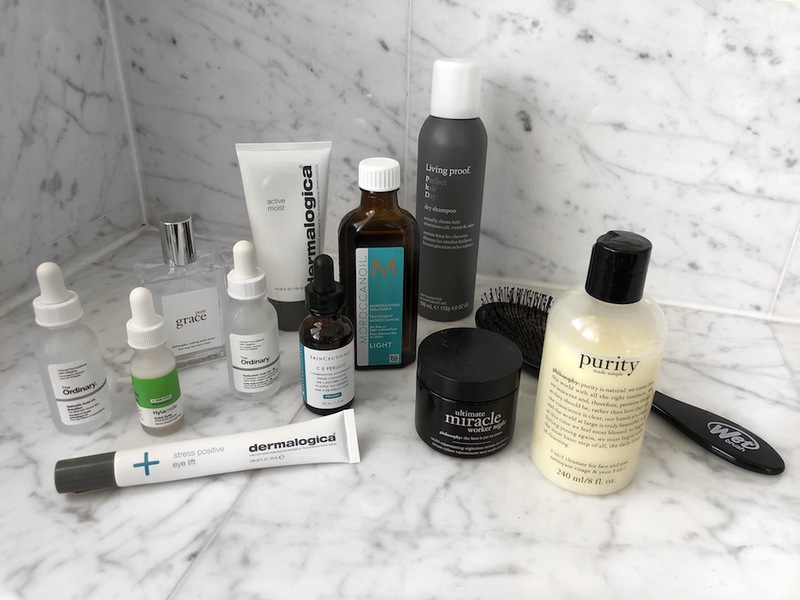 They’ve recommend the products I should continue to use, those which I should replace and ones that can work together to enhance the consistency of my skin. During the day I’ve been sticking to this Active Moist cream and it is fast-drying, refreshing and doesn’t negatively impact my makeup application. My facialist, Praneeta, also recommended this Stress Positive Eye Cream, which you can use daily (in conjunction with the SubQ Eye Serum) or as an eye mask a few times a week. The combo has made a difference in my fine lines but I’ll have more to report once I check in with Praneeta on how hydrated the skin around my eyes is next week. I have rediscovered MoroccanOil and I am sorry I ever stopped using it. I have been using the Light Oil Treatment before blow drying because despite how it looks, I actually have pretty thin hair (just a lot of it). It makes my hair so soft and helps it dry smooth and shiny with minimal flyaways – and if you follow my Insta Stories you know how I feel about those damn flyaways. I also use this Intense Hydrating Mask because despite wishful thinking, this weather has been no friend to my colored hair and the mask once a week really helps it stay hydrated. You know how I feel about my Clarifying Clay Masque from SkinCeuticals but recently I’ve added the C E Ferulic into my morning routine and I just adore it. It’s another serum that absorbs quickly, creates a plumpness to my skin and doesn’t affect my makeup application for the day. Last but not least, there is one gem that has made my hair-washing routine a breeze and that is the Perfect Hair Day Dry Shampoo from Living Proof. It honestly is like washing your hair without washing it (which you know for me, is the way I roll). I love that the brand has a travel size because I also have a tendency to skip a hair wash in lieu of enjoying my surroundings while on holiday. I will obviously continue to update you on how the above products are working and in the meantime if you have any questions or have items that I absolutely need to know about then sound off in the comments below or send me a DM on Insta. Your suggestions are always welcome, x.